Colorful blankets and lawn chairs covered most of Forsyth Park on Oct. 5. 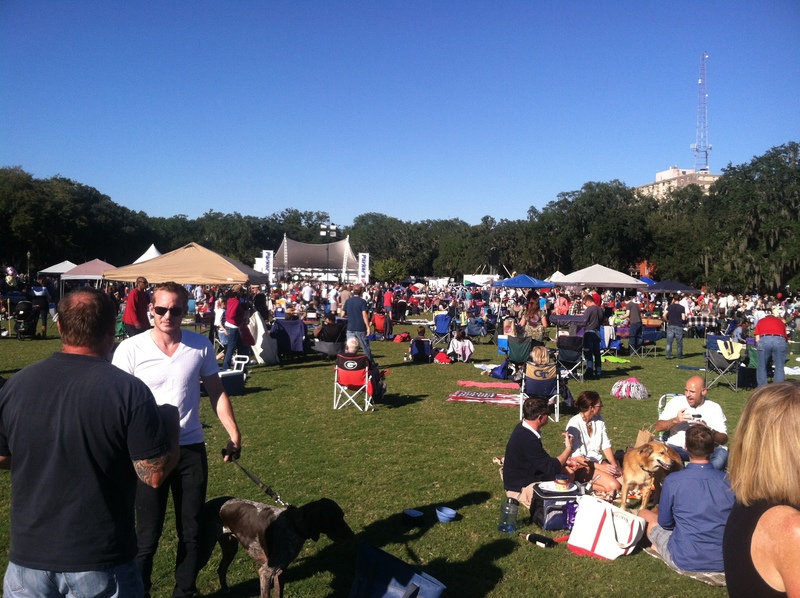 Savannah’s Picnic in the Park brought together a vast amount of adults, children and pets to enjoy a beautiful fall day. Musical performances from the Savannah Arts Academy Orchestra, Equinox Jazz Quartet, and more, gave the community picnic a comfortable and family-friendly vibe. Every year Savannah celebrates National Arts and Humanities month with the event, and nothing says art more than decorating a picnic spread. This year’s theme for Picnic in the Park was ‘Fly Me to the Moon’ and picnickers entered the contest to see who had the best picnic spread. The two women put together a spread on top of a blanket with constellations sewn on it. They also had tables of macaroons, cheese and crackers, and a globe-like trinket with the phrase ‘Fly Me to the Moon’ painted on it. Many groups of friends and family were just as excited as Kimberly and Brittany for the legendary contest. But some families simply came to relax and enjoy the atmosphere. “We come every year; in-fact this is our 10th year coming. We just love the outdoors, listening to music, and seeing our friends,” Savannah locals Barret and Cindy Welsh said. Even though Picnic in the Park celebrates the arts and humanities, it also celebrates family. Amongst the crowds of adults, there was an equal amount of young children playing soccer, running around, and having fun. Dozens of people gathered to eat delicious food and spend time with their loved ones. Elizabeth Reese, who works in the med-tech department at Armstrong came with her daughter and met up with her family to enjoy the event. Just as the theme says, the city of Savannah went from having fun in the sun to relaxing under the moon and stars as the night carried on. Crowds sat on their blankets listening to the music while feeling the essence of romance and art. The packed event was highlighted by a performance by the Savannah Philharmonic, who entertained the crowds and brought the park to life. After intermission, the Savannah Philharmonic presented the crowd with a Star Wars themed piece, bringing a twist to the phrase ‘Fly Me to the Moon’.